The set includes one stand, two universal dock adapters, a set of anti-dust plug stoppers, a screen protector and a clothing cloth. It is specially designed for iPhone 4 and iPhone 4S. 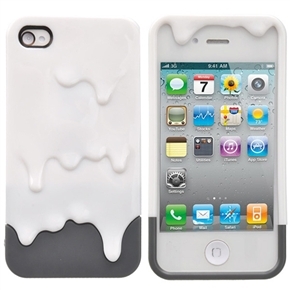 Its back case is made of hard plastic material to well protect the iPhone from dust and scratch, and designed with detachable 3D melting icescream pattern with comfortable feeling. - Back case color: white+grey. - Back case material: durable hard plastic. - Fully compatible with iPhone 4 and iPhone 4S. - Detechable 3D melting icecream style design, with comfortable feeling. - Can effectively protect the iPhone 4/iPhone 4S from dust, scratch and other damages. - Unique design allows total and easy to all the controls and ports. - Light weight, easy to install and remove, and conveient to carry. - Come with one stand for horizontally support your iPhone 4 or iPhone 4S for easy viewing. - Come with 2 univeral dock adapters which enable your iPhone 4 or iPhone 4S to connnect to any products that use the universal docking system. - Come with a set of anti-dust stock plug stoppers, for well preventing the plugs from dust. - Also come with a LCD screen protector and a clothing cloth for well protect the phone's screen and prolong the screen's life.